DUPORTH (AUS) (Bay or Brown 2005-Stud 2010). 3 wins to 1400m, BTC Cup, Gr.1. Sire of 227 rnrs, 151 wnrs, inc. SW Hey Doc (VRC Australian Guineas, Gr.1), Valiant Spirit - Beauty Spirit (H.K. ), Dashing Fellow, To Excess, Ruettiger, SP Duplicity, Cornrow, Tizso Wicked, Dee Nine Elle, Inkling, Two Over One - Wingold (H.K.) and of Let's Party Marty, Eminent Knight - What Else But You (H.K. ), Paceman - Sunny Dragon (H.K. ), etc. Rippin 'n' Tearin (g. by Duporth). 3 wins. See below. Gordian (g. by Duporth). Winner at 1200m in Aust. Sonic Flash (g. by Lonhro). Placed in Aust. WHOEVER (Redoute's Choice). 3 wins. See above. Cool and Neat. 2 wins at 1400m, 1600m to 2018-19 in Aust. and HK, HKJC Macau-Taipa Bridge H., 2d HKJC BMW Centenary H., Nanjing H.
CALANDA (Snitzel). 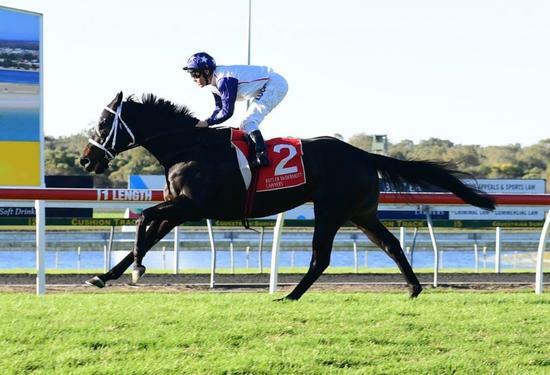 6 wins at 1100m, 1200m, A$563,825, to 2017-18, Clarence River JC Ramornie H., L, Gosford RC Takeover Target H., L, ATC Inglis Sprint, Schweppes H., Bowermans Office H., Schweppes P., 2d BRC George Moore S., Gr.3, 3d SCTC Moreton Cup, Gr.2, ATC Membership H., 4th VRC Mss Security Sprint H., L, ATC Razor Sharp H., L.
Boat Quay. 3 wins to 1450m, MVRC Connex Plus H., SAJC Australian Manufacturing Workers Union P., Scott Group of Companies, 3d SAJC Sealink Travel Group H., VRC Sunday Herald Sun P., SAJC Distinctive Homes H. Producer. Vaz de Torres. 6 wins from 1300m to 1650m, A$109,400, BRC Mount Franklin P., Aitkenvale Family Health Centre H., Corona Beach Party H., Ambassador Travel H., 3d BRC Blackdown Accommodation H., Stradbroke Eve Calcutta H.
Stratford (Stratum). 4 wins at 1100m, 1200m, A$302,900, GCTC Magic Millions P., ATC Congratulations Lonhro H., NAB Corporate H., 2d ATC Rydges Bankstown H., 3d GCTC Magic Millions Cup, RL, ATC Sharp Fly H., 4th ATC Southern Cross H., Gr.3. Superforce (Mukaddamah). 4 wins to 1200m, A$98,600, S$4,687, VRC Heron Bridge H., MVRC Le Pine Funeral Services H., Strathayr H., 2d MVRC Symphony Facial Tissues H., 3d VATC Zeditave S., L, MVRC CGU Insurance Trophy, 4th VATC Christmas H., L.
Hinchin Time. 2 wins at 1400m in 2017-18 in Aust. Race Record: 20 Starts 3-1-4 A$41,200. 3 wins from 1200m to 1600m to 2018-19 in Aust.